“What we have here is miraculous. . . .Caniell has cleaned up the material superbly — fixing pitch inconsistencies, bringing out real color from the voices, and reversing serious dynamic compression. 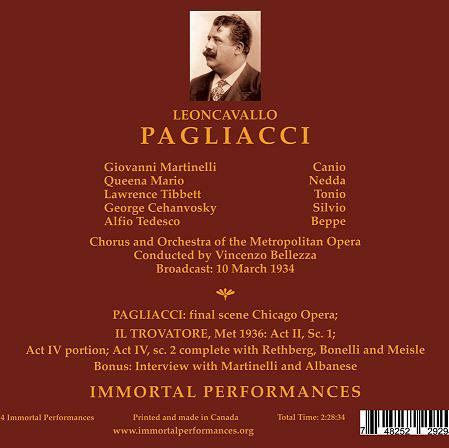 There is another Martinelli PAGLIACCI, from 1936, but with Bonelli instead of Tibbett, and yet another from 1941 with Tibbett. 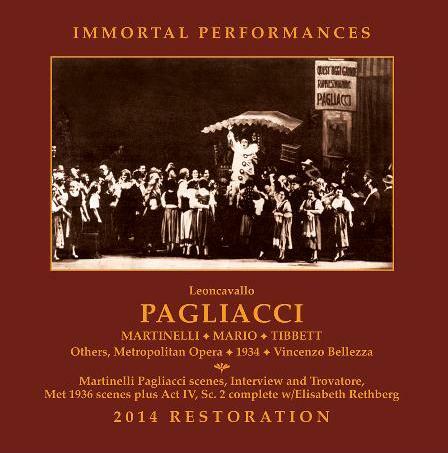 But Martinelli surpasses himself here in 1934; this is the one to hear. . .the sound has plenty of ring, and he knew the style as almost no one else did. His sense of how to shape the music was innate and deeply held within him, and his willingness to give everything he had in performance made his appearances real events. . ..This is a truly great performance, one that merits the over-used word ‘unique’. . .I found myself swept up from his entrance to the opera’s conclusion. Tibbett is the other major asset of this performance. His is a richly sung and highly dramatic Tonio. Not only the Prologue, but the duet with Nedda is a true highlight. This is a performance of rare dramatic fire and with musical thrills galore, lovingly and brilliantly restored. If you care at all about PAGLIACCI and/or the verismo operatic tradition, you must know this performance, and only in this transfer. "The recitative before 'Vesti la giubba' is nobly set forth....The aria itself is taken at the slowest possible pace, but Martinelli is more than equal to sustaining the tension of the line throughout. Each note seems dragged out from his anguished heart, yet the line never sags. His breath control is remarkable: he achieves an incredible crescendo on the climactic 'Ah! 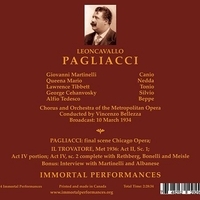 Ridi, Pagliaccio', and, like a man possessed, he keeps returning to the high As - all without any vocal strain....a searing experience....Martinelli's greatest merit is his absolute control over the the tensile strength of the musical line...."
"For Giovanni Martinelli and Lawrence Tibbett, the 1934 PAGLIACCI matinee broadcast was an occasion at least the equal of their legendary OTELLO. They’re more than ably seconded by Queena Mario’s bright, girlish Nedda…and the eager Silvio of George Cehanovsky….Tibbett deports himself with the space and majesty of a great Shakespearean actor in a Prologue which encompasses both off-the-voice parlando and fearless attack on the unwritten…high notes…. Martinelli’s dark Canio has little clown left in him; he’s shot and half-crazed by Nedda’s infidelity from his first words." "Bonelli's masterful voicing of the Prologue makes one wonder who is the premier Italian baritone of the era - he combines all the fat, rolling tone of Thomas and the point and dramatic flavor of Tibbett. Bonelli owns a voice of ravishing, darkly sensuous color, full and even throughout the entire range, with menacing bite at the bottom and absolute freedom at the top....Memories of the golden age of Italian baritones surface - Amato, even a touch of Ruffo potency - though Bonelli never pushes beyond the zones of musical taste."